The eclectic and forward-thinking indie dance band Saint Etienne has always been receptive to electronic music, since the start of their career, combining sonic elements from decades past with digitally synthesized sounds, demonstrating a wide palette of music offerings, with an emphasis on writing songs involving romance and introspective themes. In 1996, Saint Etienne commissioned a remix compilation album entitled Casino Classics. Luminaries across the electronic music spectrum, including the likes of Aphex Twin, David Holmes, Andrew Weatherall, Underworld, Way Out West, Death In Vegas, Billy Nasty, Chemical Brothers, Lionrock and PFM contributed remixes to the project. Casino Classics was released in both vinyl and digital format (an augmented multi-cd deluxe edition, with a different running order, was released in 2012) containing remixes that had already featured as b-sides on Saint Etienne’s previous singles, as well as remixes especially commissioned for the collection. 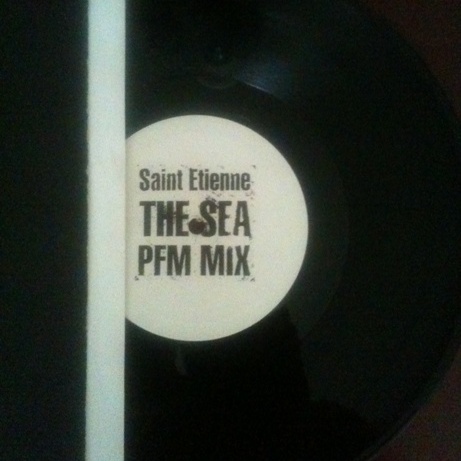 One of the standout tracks of the compilation is the impeccable remix of The Sea by PFM. The original track, entitled Down By The Sea, had been previously unavailable in its original form and eventually featured a year later in Saint Etienne’s Continental LP, exclusive to the Japanese market. PFM’s mix of The Sea was also released as a promotional, single-sided, 10” stamped vinyl on Heavenly Records (catalogue number: HEAVENLP16P2, 1996). It is an exquisite showcase of quality synths and layered up hybrid textures, in accordance with the PFM trademark sound. With masterfully programmed drums and percussions, the track features one of the most glorious breakdowns, with sounds of sea waves breaking ashore. Stripped of all the vocals (not too many actually in the original version) apart from the snippet “Down by the sea”, Sarah Cracknell’s ethereal voice concludes a drum and bass symphony. PFM (stands for Progressive Future Music) is a drum and bass outfit synonymous with the atmospheric and mellower side of drum and bass. PFM was formed in Suffolk by Mike Bolton and Jamie Saker, after meeting with Bukem in the early 90s, who eventually convinced them, a few years later, to enter the studio. They made their discography debut in 1995 for Good Looking Records and readily followed a string of seminal classics (Wash Over Me, One And Only, For All Of Us, The Western Tune etc.) for Bukem’s label. Garnering praise and recognition for their output, PFM went on to record for Moving Shadow, delivering an outstanding remix of JMJ & Richie’s Free La Funk, as well as tracks for both volumes of Moving Shadow’s regional compilation Storm From The East; the highlight being a nod to techno and its origins, the sublime Cruising Detroit. Around that time, Saker left the band and Bolton effectively carried on PFM as a solo project with remarkable success. After a short spell with Polygram’s subsidiary Go! Discs, Wall Of Sound and Heavenly, delivering remixes for the aforementioned labels’ artists, PFM enjoyed a creative and prolific period, establishing himself as one of the most high-profile drum and bass remixers of the second-half of the 90s. PFM has engaged in remixing duties for the following artists: Art Of Noise, Lisa Moorish (Saker is credited also for the remix of Love For Life), David Holmes, Mandalay, Mulu, Eat Static, Trickbaby, Akasha, Espiritu, Forces Of Nature and Lil’ Louis & The Party. In 2000, Bolton re-signed with Good Looking, searching again for the creative freedom he always craved for. He stayed under GLO’s umbrella until 2004, recording new material for Good Looking and its offshoots, including a remix of MC Conrad’s Halcyon Voyage for the 4th installment of the Logical Progression series. After a 6-years production hiatus, PFM re-emerged in 2010 with tracks on Telluric, Plush, Phuzion and a brilliant remix of Touch Feel (by Justice & Metro) on Modern Urban Jazz. This entry was posted in Tracks I Wish I'd Written and tagged Akasha, Andrew Weatherall, Aphex Twin, Art Of Noise, Billy Nasty, Casino Classics, Chemical Brothers, Continental, David Holmes, Death In Vegas, drum and bass, Eat Static, Espiritu, For All Of Us, Forces Of Nature, Free La Funk, Go! Discs, Good Looking Records, Halcyon Voyage, Heavenly Records, Jamie Saker, JMJ & Richie, Justice & Metro, label, Lil’ Louis & The Party, Lionrock, Lisa Moorish, Logical Progression, LTJ Bukem, Mandalay, MC Conrad, Mike Bolton, Modern Urban Jazz, Moving Shadow, Mulu, music, One And Only, pfm, record, remix, Saint Etienne, Sarah Cracknell, Storm From The East, The Sea, The Western Tune, Touch Feel, Trickbaby, Underworld, vinyl, Wall Of Sound, Wash Over Me, Way Out West. Bookmark the permalink.